Online Marketing has evolved and taken on many forms over the past decade. On average, 22% of marketing budgets are spent on Search Engine Marketing alone (Econsultancy). The online marketplace is flush with consultants and providers that make big promises, but lose clients due to an inability to execute on those promises. TopRank Marketing makes it our mission to deliver the results that we promise to our clients. SEO agencies, corporate marketers and PR firms around the world use PRWeb as an essential tool in their mix of SEO and online marketing tactics. As a testament to our expertise and longstanding relationship, PRWeb has chosen to work with TopRank Marketing to be it’s SEO agency. We would also like to take this opportunity to share what has made the TopRank Marketing and PRWeb’s SEO, Social Media and Content Marketing program successful. PRWeb is a leading provider of online press release distribution services. The company strives to provide a robust tool at an affordable price for organizations of any size, enabling them to increase online visibility in news and regular search engines like Google as well as attract new customers. 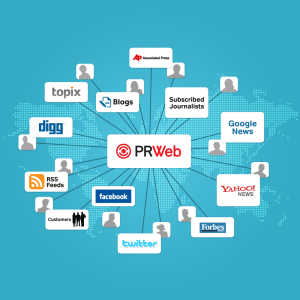 PRWeb thrives on creating a simple and efficient means of distributing your company announcements on major news sites and search engines on the Internet. The graphic below shares a sampling of just a few of the online news sources that PRWeb will interact with on your behalf. Blogging: The teams have developed concepts based on search trends and customer pain points to provide a cohesive content marketing strategy. We have found that by implementing a cohesive program based both on search engine visibility and unique content we are able to drive traffic and build awareness. 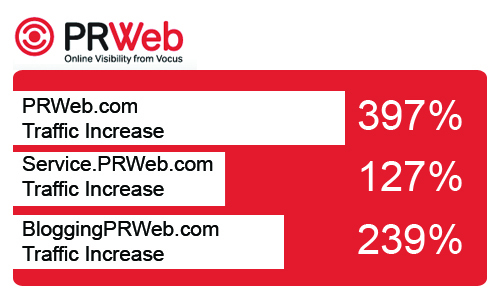 The improvement of quality traffic has ultimately led to an increase in customers for PRWeb. I would like to better engage my current and potential customers. I know that I need to execute a meaningful content strategy but am not sure where to begin. I am currently executing an online strategy but my results are not aligned with my efforts. I simply don’t have time to formulate and execute an online marketing strategy. Ultimately, I would like to acquire and retain more customers. If you believe that any of the statements above reflect your current situation and you too would like to get in front of more customers by executing a cohesive, engaging, customer centric marketing strategy please do not hesitate to contact us today.